When the New York State Factory Investigating Commission was formed after the horrendous Triangle Shirtwaist Factory fire in 1911, one of their concerns was working conditions for women. This photograph was taken by the Commission in 1912 at the International Harvester Company in Auburn, New York. The factory superintendent told the investigator that women had recently been ordered not to handle hampers, but the investigator saw this woman pulling two hampers at once. 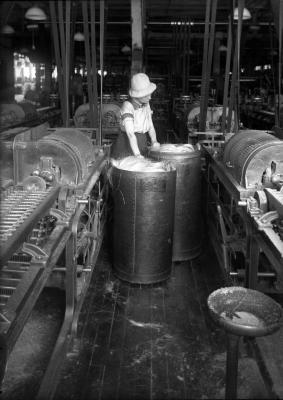 Woman pulling and pushing barrels of hemp in the International Harvester Factory, 1912.